At UNB, Jeremy Murray is known for his sense of humour and diverse involvement in student groups and societies. But he's perhaps best recognized for his activism in raising awareness around disability and accessibility issues on campus. The media arts and culture program graduate has cerebral palsy. As a result, Mr. Murray's motor skills are impaired and he relies on an electric wheelchair to get around. 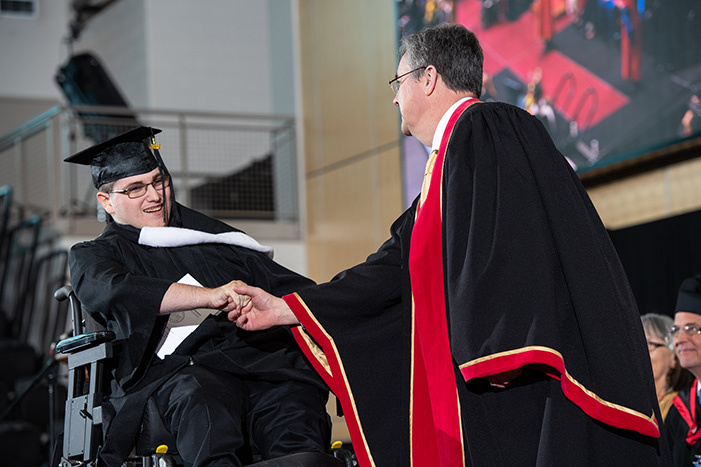 When he first came to UNB Fredericton in 2011, he was determined that his disability would not get in the way of his university experience. "At UNB, I grew into myself. I achieved so many things while experiencing a 'normal life,'" says Mr. Murray, who is from Second Falls, N.B. "The UNB community was a big part of that experience. If it wasn't for the people I met, I don't know how my time here would have gone." Andrew Daley was Mr. Murray's accessibility advisor, friend and mentor at UNB. He saw in Mr. Murray a diligent, conscientious and communicative student. "Jeremy became my student assistant at the accessibility centre," says Mr. Daley. "When other students needed guidance with the assistive technology, he always stepped in to help." Soon after, Mr. Murray was selected as a student advocate for the accessibility advisory committee. He helped to formulate strategies for campus infrastructure, and determined where ramps, lifts, elevators, signage and accessible bathrooms were required. "Truly, the university and city are better places for his time here," says Dr. Lauren Cruikshank, a media arts and culture professor at UNB. "They now know how to continue to improve, and where there is still work to be done." In addition to his advocacy and academic work, Mr. Murray spent five years as a RedShirt, ushering in new students during orientation week. He served on the Student Union for three years, and was an active member of the Media Arts & Cultures Student Society. Through it all, Mr. Murray maintained his website JJSM Creations, while living on campus in the Elizabeth-Parr Johnston Residence. Now that he has graduated, Mr. Murray plans to focus on his film production company, LIW Accessibility Productions. "The more people see proper representation of disability, the easier it will be to normalize in society," says Mr. Murray, who has the eventual goal of employing people living with disabilities. "I couldn't be prouder of Jeremy and his accomplishments as he crosses the stage to collect his bachelor of arts today," says Dr. Cruikshank. "In class and beyond, Jeremy proved himself at every turn to be an insightful critical thinker, a fierce and determined boundary breaker, and a delightful person with a quick wit, a very quick chair, and an even quicker laugh."